These recipes were clipped from packaging of some kind, likely from None Such Condensed Mince Meat since it’s mentioned as an ingredient. You’ll find both recipes typed below along with a scanned copy of the clipping. Date unknown. In small saucepan, crumble mince meat; add water and sugar. Cook and stir over medium heat until lumps are thoroughly broken. Boil one minute. Cool. 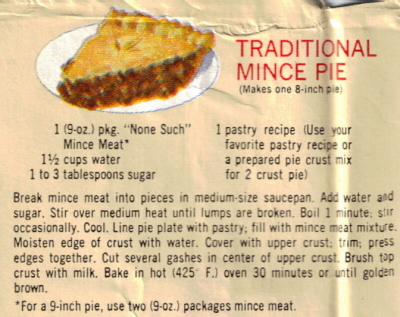 Line 8-inch pie plate with pastry; fill with mince meat mixture. Cover with top crust. Flute edges. Cut 4 gashes in center of top crust. Bake at 425° for 30 minutes or until golden brown. In large bowl, cream shortening. Gradually add sugar, blending well after each addition. Add eggs and beat until smooth. Sift together flour, soda and salt. Gradually add to creamed mixture. Crumble and stir in mince meat. Drop mixture by teaspoonfuls onto greased baking sheets, about 2 inches apart. Bake at 400° for 12 minutes or until lightly browned. Thank you, thank you, I lost the back of my box for the cookies, but now I cannot find the product. The only one I see on the shelf is the jar. What shall I do? Just stumbled on this post after making the cookies…which are fantastic! 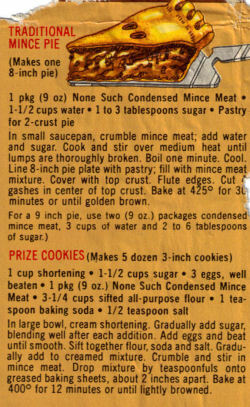 Borden’s condensed mincemeat is available via amazon.com. Oh my goodness! !! I’m doing my HAPPY DANCE! Our family,has used this recipe for around 5 yrs . I had lost the packaging recipe. Thinking I could get another, I have been unable to find the condensed mincemeat. Thank you so very very much for the amazon.com info. Now our tradition can live on.